Re-planning: Path to Success or Mark of Failure? When did you last revise your project plan? Did it make you feel you had failed, or did you feel it was an essential step on the path to success? I would argue that re-planning is a necessary part of projects. I have met people who felt that “re-planning” or revising a project plan was an admission of defeat. They feel they should have anticipated everything in advance and built it into the original plan. I think they are being unnecessarily hard on themselves. Unless you have complete foreknowledge about everything in and around your project, then some degree of re-planning is inevitable. To oversimplify things a little, there are two kinds of project, “Waterfall” and “Agile”. 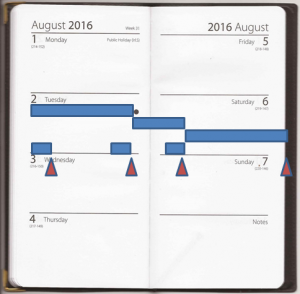 With Waterfall, you can really only plan one phase at a time in any detail. That means that one of the concluding outputs from each phase is the detailed plan for the next phase. This means that you have to revisit the plan with each new phase. It’s an essential part of the method. With Agile, you plan each iteration or sprint as it comes up. Again, this means planning again and again. The plans may be smaller, because the steps are smaller but they are still there. In both cases the smaller plans fit within a larger, coarser grained project plan. How up to date is your plan? One of the advantages of re-planning or revising your plan is that it allows you to take what you have learned from your project into account. It means that the projections in you plan are more likely to be accurate and therefore you can take action to try to achieve them. Having an out of date plan which contains unachievable completion dates is demotivating. Bring your plan up to date and then manage to the up-to-date plan! Previous Previous post: Check-Point: Are you where you want to be? Next Next post: Simple ideas are the best – BA toolkit?